The Legal Intelligencer has reported that the Pennsylvania Supreme Court granted allocatur in the case of Lipsky v. State Farm on the issue of whether emotional distress without physical injury can be covered under an automobile insurance policy’s definition of "bodily injury." By way of background, in Lipsky, a parent and siblings witnessed their family member get fatally hit by a car were seeking damages under the bodily injury portion of the policy that covered the car. In a September 2011 opinion, the Pennsylvania Superior Court ruled the family could collect damages under the policy. That court found that witnessing a family member be killed by a car is a distinct bodily injury covered under the definition of “bodily injury” found in the insurance policy. The previous Tort Talk post on that decision can be reviewed here. Here is a link to the copy of the Supreme Court Order granting allocatur and delineating the issues to be addressed (Note that the Order appears to be incomplete when you go to the link but apparently that is a typo). 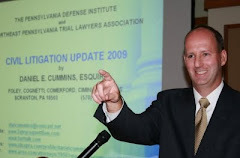 Source: "Pa. Supreme Court Takes Up NIED Insurance Case" by Gina Passarella of The Legal Intelligencer (April 25, 2012).